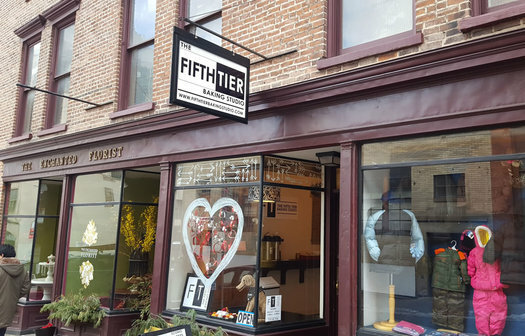 The opening of Fifth Tier Baking Studio earlier this winter had been a long time coming, complicated by a series of difficult tragedies for the owner, Lyle S. Houston. Now that it is open, it has speedily become a go-to for hungry downtown workers and commercial accounts seeking homespun pastry. The cinnamon bun ($3.50) explains the style of the bakery well. Deftly crafted at a fair price, the hearty treat will soon become a downtown culinary staple in the same manner that Cider Belly donuts and potato chips with blue cheese sauce from DP's have. The cinnamon bun starts with a basic yeasted sweet dough recipe, combining flour, milk, and butter with eggs for a golden brioche-like base. Notes of dried fruit come through with the dough, as though raisins were incorporated, but it's simply the fermented nature of the dough cutting through the richness of the filling and the sweetness of the frosting. The dough is chewy and slightly crusted at the top. 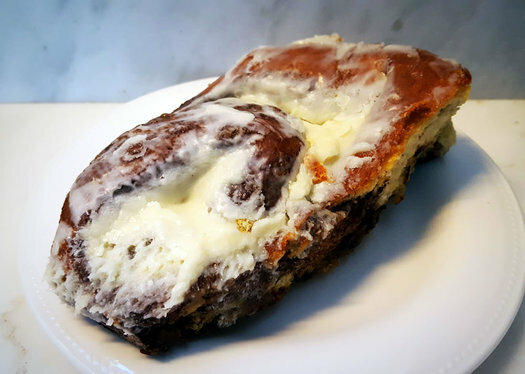 The filling -- a combo of butter, brown sugar, and cinnamon -- ripples through the spiraled dough and bubbles up over the top to create little pools of loose streusel that are nutty and toasty in flavor. The dough-to-filling ratio is spot-on, never feeling too sticky or too dry. The buns are formed, raised, and baked in batches, nestled together so the sides of each remain soft. They press into each other creating an array of rhomboids and ovals, each a little different than its neighbor. A classic cream cheese frosting is slathered over the top, adding tang to balance the saccharine nature of light, sifted confectioners sugar. Is the calorie-bomb worth what Fifth Tier's cinnamon bun can offer? Absolutely. You could, of course, peel-and-pop a can of factoried cinnamon rolls at home, but Fifth Tier's offering is what a true cinnamon bun should taste like. And that sort of craftsmanship is worth seeking out. Yup, best cinnamon bun to be had in the Capital Region. Let me add that their anise biscotti are also the best version of that Italian classic (with all due respect to some of the local Italian bakeries). @chrisck -- I'll make a note to check that out. I love biscotti. I feel it gets so overlooked! Strong coffee kissed with cream and a piece of biscotti to dunk into it is my idea of a perfect afternoon pick-me-up. Thanks for the rec!